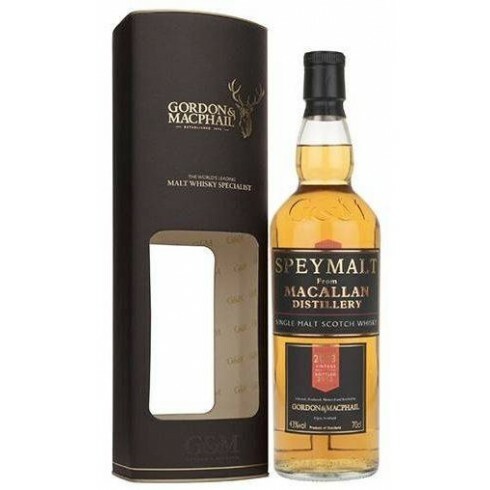 Gordon & Macphail Single Malt Scotch Whisky Available | Saporidoc UK. Bouquet Delicate Sherry influences with hints of raisin, banana, and beeswax polish. Sweet fudge notes are complemented by crisp lemon aromas. Taste Cracked black pepper with apple, banana, and grapefruit flavours complemented by a milk chocolate and brazil nut edge. Pairs with This Single Malt Whiskey is delicious if drunk pure, and changes completely when mixed with water to give another lovely after dinner drink. The Single Malt Scotch Whiskey "Speymalt Macallan Distillery" 2007 is produced in the town of Elgin, in the north-eastern Scotland, considered "the world capital of Whiskey". It is here that in 1895 the Gordon & Macphail was founded. After distillation the whisky was matured in first fill and refill Sherry casks. Bouquet: Delicate Sherry influences with hints of raisin, banana, and beeswax polish. Sweet fudge notes are complemented by crisp lemon aromas. Taste: Cracked black pepper with apple, banana, and grapefruit flavours complemented by hints of milk chocolate and brazil nut.